Hey Mom, Put Down Your Phone! My mom makes us have “family time” and watch a movie but stares at her phone the whole time. My parents are constantly on Facebook or playing Candy Crush when we are together. Why do they say I’m always on my phone when they are even worse than I am? My dad always sends emails at the dinner table, but I get in trouble if I look at my phone. I tell my parents “family time” doesn’t count if they are on their phones but they say all that matters is that we’re in the same room. Were your parents always on their phones too? First, let me just admit that I am not yet a parent, but I struggle with this as well. When I sit down to watch a show with my husband, it is easy to mindlessly scroll through Instagram or Facebook out of habit. Sometimes I don’t even notice I’m on my phone until he points it out! Second, it is never fun to get called out by teenagers, but my group issued a challenge that I feel obligated to pass on! Also on a side note, I laughed out loud when they asked about my parents and their phone use when I was a teenager. When I was in high school, we didn’t have internet on our phones, and we certainly didn’t have fun games like Candy Crush (RIP Snake Game). This is fairly new territory for parents! Technology isn’t going anywhere, phones aren’t going to phase out, and social media will probably always be king of the internet. So how can we better model how to balance family, work, and fun? We have to be the example in this area; otherwise, our kids will never learn acceptable boundaries and healthy practices. Before I offer some suggestions, there are a few things I would like to point out about their statements and questions. 1. They watch you and notice. You know the phrase, “Do as I say and not as I do”? That doesn’t fly with teenagers. They watch you. They see what you do and will push back if what you do is different than what you say. Telling teens to put down their phones while yours is still in front of your face sends a clear message that you probably aren’t intending to communicate. 2. They don’t see a difference between work and social media use of phones. 3. They think you have a technology problem. This absolutely cracks me up! As adults, we read books, listen to podcast, and attend seminars on helping our teenagers manage social media and their phones. We talk about this generation and their problems with connection, but they think adults are the ones with the problem! I am not saying that teens have technology under control or use it appropriately all the time, but until we prove them wrong, I do believe we are the ones with the problem. When they were having this discussion, they weren’t upset that they had to be present for family time. They were mad that their parents were violating the time that they set aside. One student even said that he enjoys hanging out with his mom when she isn’t distracted by her phone. I really don’t want you to miss this point, so I will say it again in case you’re still in shock…teenagers actually care about “family time”! Even when they act like spending time as a family is the worst inconvenience, the stories they tell when you aren’t around would say otherwise. As I said above, this is a newer problem for parents. Just like we are trying to figure out how to help our teenagers have boundaries, we are walking the same blurry line. I want you to have a good relationship with your teenager. I want you to be able to take advantage of family time – if they are willing to set aside their phones, don’t ruin it by being on yours! While I could write several blogs on this topic, let me start with two tips that I believe could make a huge difference in your home! Do what you ask of your kids. This seems simple and like a no-brainer, but the more I talk to teens, the more I realize that we are failing at this. While their are perks to being an adult and setting the rules, when they are around and watching you, follow your own rules! If you ask them to put away their phones for a specific time or activity, do the same. Do they have a time limit on how much they can be on their phones? Try to stick to a similar schedule! They are watching you, and you set the example of how to interact with your phone. This is especially true for when you drive. 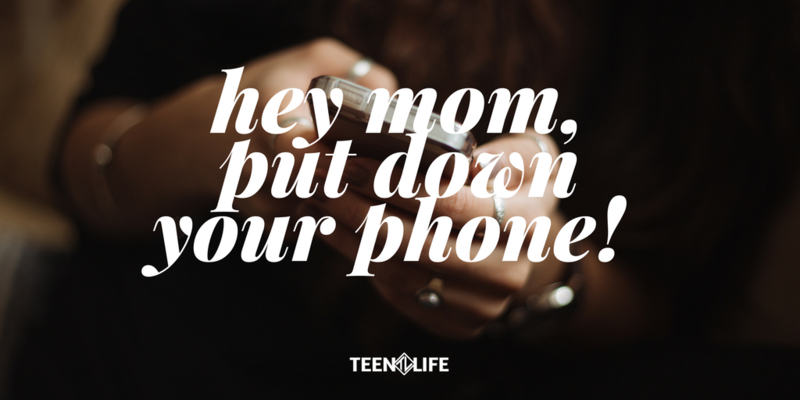 Ouch…but if you don’t want your teenager to text (or tweet) and drive, put your phone away in the car. Don’t text, don’t have phone conversations that can wait until you get to your destination, don’t be catching up on your Facebook comments while you are driving your kids. Show them how to be responsible and safe! Find small ways to make the time you spend as a family special. While it may be unrealistic to expect your teenager to put their phone away anytime they are are with a family member, you can set aside specific times that are phone-free. Some examples could be dinner time, the first 15 minutes after they get home from school, special family activities, or when you watch tv or a movie as a family. Once you ask them to make the activity you decide on phone-free, follow the rule above and put yours up as well! This might mean that you put your phone on “do not disturb” to keep you from reading texts, checking email, or answering phone calls. Unless it is an emergency, anything on your phone can wait until that sacred time is over. You communicate the importance of family time by your actions. Distractions and phones can kill a family moment – don’t let your teenager down by not giving them your full attention! So, what do you think? How have you set boundaries in your home? How have you made family time sacred and special? Share with us – we always love new ideas! Well done, Karlie. While I’m not on any social media sites, and as I watch people at the Ballpark on their phones and paint no attention to the game, I wonder how I made it to grandfather hood without technology at my fingertips. The saddest part to me is that we write nothing down, print few photos and will leave no record that we were even here. Is its too late to encourage young people to write instead of text?